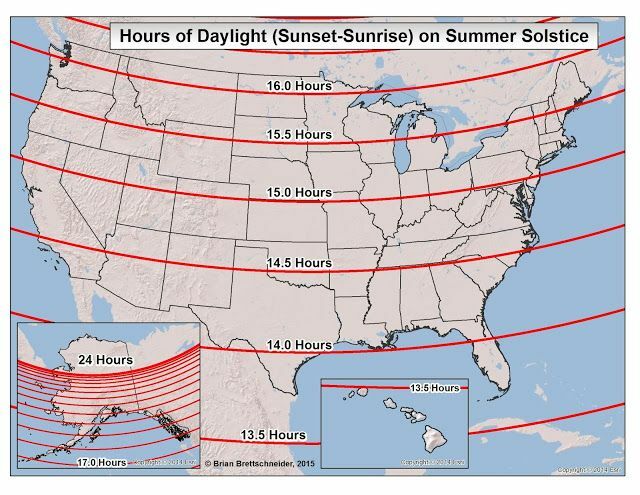 Longest day of the year was Monday, and here in Portland, Oregon that means it’s not full dark until about 10:30 p.m. I was in Fairbanks, Alaska one summer when it was still light at 11:30, but what we have here is still a long day, since it gets light at about 5 in the morning. The chart shows sunrise to sunset, but of course it gets light earlier and stays light quite a while after sun sets. It feels strange to look out the window at 10 at night and think it must be about dinner time, when said dinner was consumed about four hours ago. How long is your longest day of the year? Pretty long too. And it gets light too early. The light streams in the bedroom windows that are too high for us to reach (ten or twelve feet). Need to get a handyman to put some sort of filter on it. Patti, we have blinds on our tall landing wIndows with a remote control. We can raise or lower one or both with the push of a button. Battery operated so no wiring required. You can get powered blinds in any style. Pretty long. It doesn’t get dark here until nearly 8 now. 8 makes sense, 10:30 doesn’t. But we’ve gotten used to it. We’re in the 14 hour band (southern Louisiana). I usually let the dog out for a final run at about 8:00–and it’s still light when I open the back door, but by the time I call her back in about 8:30-ish, it’s dark. I’m always awake early, so it’s generally still dark regardless of season. We’re early risers too, Deb, mostly because at first light one of the cats jumps on the bed and walks up and down on Barbara until she gets up and feeds the beasts. Luckily I’m usually able to turn over and get another hour, during which time she reads the paper and has her coffee. We’re in the 15-hour of light zone. When it’s still light at 9 P.M. it feels weird. Our sunset is just after 8:30 but, as you said, it is light later than that. One year we left for England as soon as school ended here in late June. By early July we were in Edinburgh, some 500 miles north of London. (An aside – I think people think New York and London are on the same latitude. They aren’t. We’re at 41 degrees north, London is at 50. You could look it up.) In early July it was still light out in Scotland at 10:30 at night. We had to make sure the hotel curtains were tightly closed if we wanted to be able to sleep. In was pretty cool, actually. The sun setting at 4:30 is one of the worst aspects of winter. I can’t even imagine living in Alaska or Scandinavia. No wonder there are so many suicides there. Oh, it is light by 5 or 5:30 now. The sun definitely bothers Jackie in the morning. When it is hot enough to need the air conditioner at night we can lower the blinds, but I prefer open windows and the fans. I’m up early too. Richard, I don’t think we have the “longest day of the year” in the tropics. We have mostly regular days and nights. My longest day was Sunday, when I spent almost 6 hours making a drive that should have been 3 1/2, tops. Ha! Traffic must have been fierce.